The Sheriff’s Office would like to extend our sincere appreciation to the media for their efforts in quickly communicating this information to the public. We would also like to thank all of the citizens who shared this information on social media. HANOVER, Va. – The Sheriff’s Office is asking for the public’s help with locating a missing juvenile. 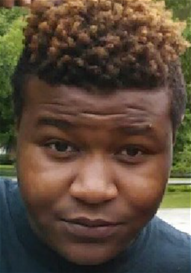 James Donye Simonson, 16, was last seen in the 6300 block of Kristy Star Lane in Hanover County. Simonson is described as a black male, approximately 5’9” tall and weighs 270 pounds. He was last seen wearing a white t-shirt and grey sweatpants. Simonson could possibly be heading to North Carolina in a small red two door hatchback, unknown make. Anyone with information on the whereabouts of James Simonson, is asked to contact the Hanover County Sheriff’s Office at (804) 365-6140 or the Metro Richmond Crime Stoppers at (804) 780-1000. Citizens can also text Crime Stoppers at 274637 (CRIMES), using the keyword “iTip” followed by their tip. Both Crime Stoppers methods are anonymous.